Is Klaviyo As Good As Mailchimp For Shopify Stores? Mailchimp is separating from Shopify. So, by May 12, any merchants using Mailchimp will need to switch to another mail service. Klaviyo is one of the most popular alternatives to Mailchimp right now. If you’re not familiar with Klaviyo, this post will give you an overview of what it does, and how it compares to Mailchimp. Who uses Mailchimp or Klaviyo? Your store is doing well. You have a custom Shopify store design that’s converting like a dream and you’re turning 6 figures in revenue each month. You’re focused on squeezing every last bit of profit from your store. Your product research is doing well, your pixel is trained, and your processes are organised so that you have time to focus on your email marketing. As you know, email marketing is not just a bunch of emails to your list. It’s the timing, the sequence, the personalization. Mailchimp has helped thousands of Shopify merchants to maximise their profits with good email funnels. But is Klaviyo a good alternative now that Mailchimp won’t be working with Shopify? Do your emails hit the inbox? Bad subject line, or just hidden in the promotions box? It’s the question that niggles at the back of every email marketeer’s mind when the open rate isn’t where they hoped. There’s no way to guarantee your mail hits the inbox every time, but there are best practices you can follow. In addition, the mail software you use can have an affect. Unless you’re using your own dedicated IP address to send emails, you’re using a shared IP pool. Meaning that Klaviyo and Mailchimp both have a group of servers and assign you a range of IPs. You share those IPs with other users in your group. But there’s an issue – if you’re sharing your IP with bad senders, your emails may end up in spam because of their bad practices. So if you’re not sure, it’s always good to check that on senderscore or ask support to change your group. Mailchimp is the best-known email marketing software for e-commerce, and this can be a drawback. Of course they try to ensure that people follow good email practices, but lots of people who have no experience are joining Mailchimp every day. It’s just law of averages that some of them will be spammers. It’s not a sure thing, so you should still rely on your own email practices as the main way to hit the inbox. But, Klaviyo has a smaller customer base, focused exclusively on e-commerce businesses. This may help get you into spam less, and so have better open rates. Automated emails are massively important. Just basic welcome and cart abandonment flows can easily amount to more than 5% of your total revenue if they are done well. And to do it well you need to continually split-test subject lines and change stuff up on those. On Mailchimp, you cannot split-test automations, whereas, on Klaviyo it’s not a problem. As you go deeper into personalization, testing these automations is necessary. Klaviyo has more powerful testing possibilities. If you’re pushing very hard with emails, you will be having new ideas all the time. Can I trigger a website popup upon people clicking an email? Can I tag people and separate them in the flow based on the time they joined? Will the flow/automation I constructed work flawlessly? When you find something you are unsure how to tackle, live support offers instant help to keep things moving. 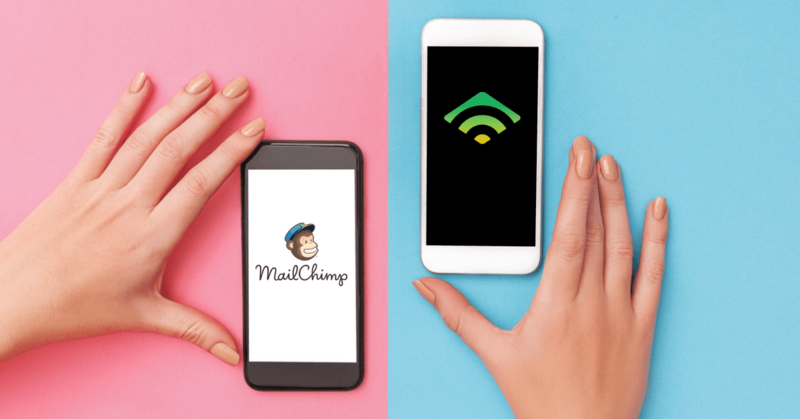 Both Klaviyo and Mailchimp offer live chat support. Shopify has deep integration with Klaviyo. Which means a ton of dynamic data. We see Shopify merchants leveraging this dynamic data to do cool things like include the name of the product a customer put into checkout into cart abandon flow, put the customer’s name into a button (Tom, Click Here) and even construct a “recently viewed items” section like Amazon. On Mailchimp, none of those things can be done. Mailchimp does have some dynamic data, but not as much in regards to e-commerce. Klaviyo can pull more dynamic data out of Shopify. Let’s say you have 40,000 subscribers. That’s already a nice list. It is the open and conversion rate that matters more than the actual list size of course, but you will be paying to use software based on the size of your list. Klaviyo 40,000 people – $700. If you have a mailing list of 40,000 active subscribers, the additional features offered by Klaviyo should make it worth the extra $250. For people just starting up, Klavio’s free account covers 250 contacts and 500 emails sent, which includes the newsletter. Also, the free account includes A/B testing tools, segmentation, and the responsive drag and drop email creator. Klavio is the more expensive option, but the price is related to the size of your subscriber pool, the same as Mailchimp. If you’re using the software to power high converting mail campaigns, the price difference not big enough to be concerned with. Mailchimp has a function that separates people by gender. If you’re selling a product that is clearly targeted at one gender, or want to sell using different messages for different genders, this could be very useful. Mailchimp has native gender segmentation. Klaviyo doesn’t. Browse abandonment is like abandoned cart, but for viewed items. So, somebody looks at a few products on the website, and then an email gently reminds them about it and gives a discount an hour later. You but can’t do this in Mailchimp. You would need external apps/integrations working with Mailchimp. In klaviyo, this is an option which is simple to set up. Klaviyo has native Browse Abandonment. Mailchimp doesn’t. Klaviyo was designed for e-commerce. It has deep integration with Shopiy and offers impressive sales boosting features like personalised recommendations and browse abandonment reminders. Due to this extra level of functionality, Klaviyo does cost more than Mailchimp, and may be more than some small businesses need. Another down side of this increased functionality is that setup can be more complex than Mailchimp. For small businesses just looking for simple mail functionality, Klaviyo may be excessive. But for a business looking to optimise and scale their Shopify store, Klaviyo looks like it could be a good replacement for Mailchimp. Frooition are not a partner of either Klavio or Mailchimp. This is an impartial post with no affiliate links.